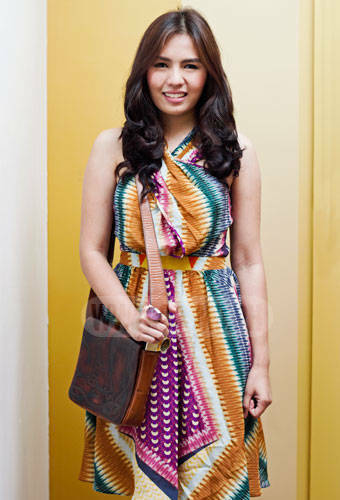 See what this business-savvy Fun, Fearless Female Awardee carries in her handy leather purse. What does a successful entrepreneur need on a daily basis? That was the question on the tip of our tongues when we met Tamlin Manaloto, founder of the popular coconut beverage brand Coco Fresco. This 25-year-old pooled her resources and took a huge risk to start her business--which can be found in many SM Department Stores--and it has paid off big time. We interviewed Tamlin before her Fun, Fearless Female Awards 2012 shoot and even got to ask her about the contents of her gorgeous Bellissimo leather messenger bag. Even though she's the owner of a multi-million peso business, we discovered that behind the businesswoman is still a simple girl with the same everyday necessities as the rest of us. Launch the gallery to see the practical and kikay essentials of this gutsy, business-savvy young woman! Watch for her online feature and the behind-the-scenes photos from her shoot, coming soon! To read more about Tamlin and the other Fun, Fearless Female Awardees, grab the May 2012 issue of Cosmopolitan Magazine with ANNE CURTIS on the cover, in stands NOW! Virtually flip through our online teaser of this Collector's Edition!